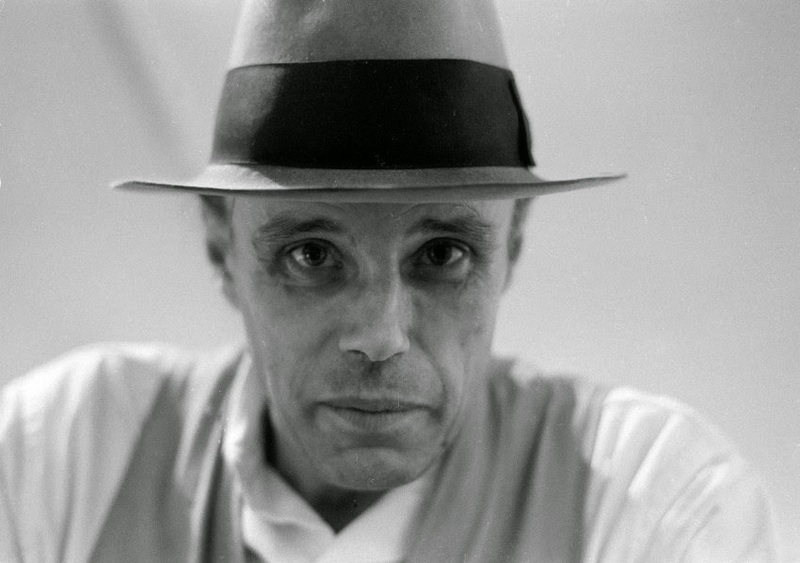 Joseph Beuys was a German sculptor, painter, installation artist, art theorist and art pedagogue, and is considered one of the most influential European performance artists. In his early school years, he was considered to have a natural talent for drawing, and he visited the sculpting studio of Achilles Moortgat many times. His later childhood was spent in the era of the Nazi Third Reich. When he was 15 years old, he was a member of the Hitler Youth, and participated in the Nuremburg rally. In 1941, he volunteered for the German Luftwaffe, first acting as an aircraft radio operator, and later part of various bombing missions in the Crimea. In 1944, Beuy’s plane was shot down on the Crimean Front. Beuys was the only person to survive the crash, and later claimed to have been rescued by Tartar tribesmen, who covered him with animal fat and felt to keep him warm and nursed him back to health. 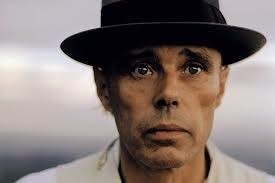 Eyewitness accounts, however, claim that although Beuys was the only one to survive the crash, there were no Tartar tribesmen. He was instead rescued by a German search commando, and taken to a military hospital where he stayed for three weeks. He was redeployed later the same year, and held as a prisoner of war after the German surrender in 1945. 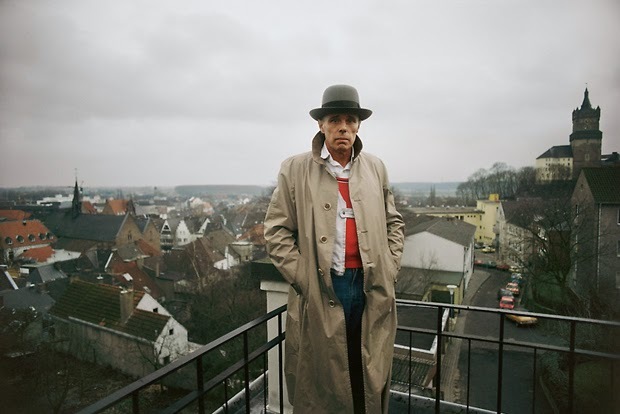 Upon his return to civilian life, Beuys became an active member in the art community, and an outspoken proponent of anthroposophy, which posited that one could experience the spiritual world through inner development. He graduated from art school in 1953, to a dire financial situation, which was compounded by the traumas he experienced in war. By 1956, he was facing a serious depression, due to his materially and psychologically impoverished situation, from which he recovered and married his wife Eva Wurmbach in 1959. In October of 1979, Joseph Beuys mounted one of the most vivid and exhilarating art exhibitions of the 20th Century at the Solomon R. guggenheim Museum in New York City. Beuys Led Colleague, John Halpern through a maze of artworks as Beuys himself personally installed and narrated the most complete and intricate assembly of his works to date before Halpern's cameras. 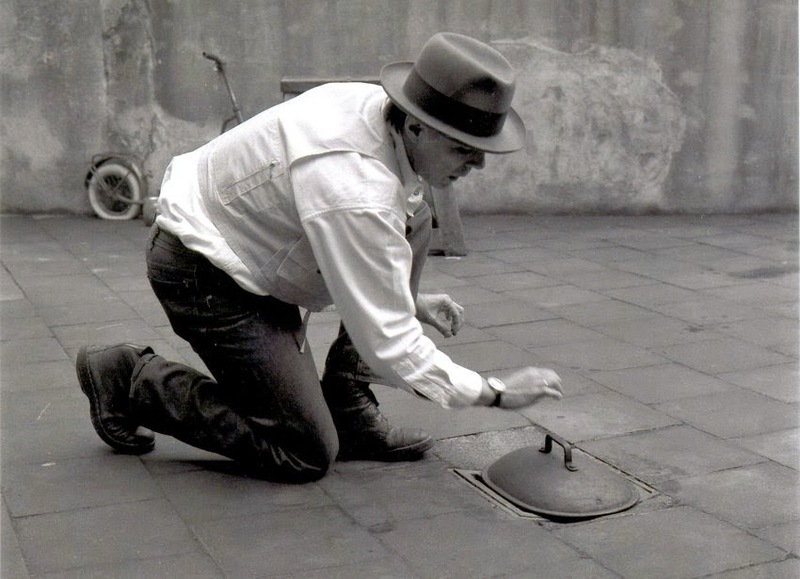 The result is one of the most in depth and vital experiences of Beuys and his art that exits in film or video, today. Cover: two-color print, design: Joseph Beuys, Adam Backhausen, Manfred Boecker. 30cm, 45RPM, EMI Electrola (Musikant), Koln, No. 1C K 052-46 614 Z. Performed by: Joseph Beuys, Klaus Heuser, Wolf Mahn, Susanne Stenchly, Gunne Wagner, Steve Borg, Alain Thome, Helmut Russmann, John, K.H. Putz. Contents: Sonne statt Reagan. Krafte sammeln. I met Joseph in 1977. He had invited myself, Gianfranco Mantegna and Ruth Russell to dOCUMENTA, in Kasel, Germany to speak about the BRIDGING project. We had climbed the 7 bridges of Manhattan together as ART CORPORATION OF AMERICA INCORPORATED along with 4 other friends and 30 ground support. The intention was to alter new content with creative and empowering information and to keep terrorism from being in the press for one day. Upon meeting Joseph I proposed a film about his art to explain it to an American audience. He immediately agreed and I completed Joseph Beuys/ Transformer in 1988.